Analog versus digital technology: What are the differences between analog and digital? Which is better? Antennas and transmitters: How do we send and receive radio waves from one place to another? Bluetooth: A simple way to connect wirelessly to nearby electronic equipment. Digital cameras: How a digital camera represents photographs in numeric form. Film cameras and photography: Old-style photography uses light-sensitive film to capture images of the world. Cellphones (Mobile phones): How mobile telephones use radio waves to field calls. Data-matrix codes: Two-dimensional barcodes that store much more information. 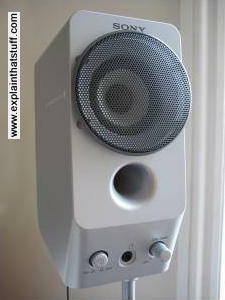 Directional loudspeakers: Loudspeakers that focus sound on a very specific area. Electronic ink: Why is the display of an electronic book easier to read than a computer screen? Fax machines: How to send pictures down an old-style phone line. Fiber optics: How light can zoom down glass and plastic cables, taking computer data with it. Flares: Guns that send warning signals high into the air. Fountain pens: Why pens need to fill up with air to make ink flow onto the page. Internet: The world's most important communications network. Headphones: Loudspeakers that clamp onto your ears. We take them apart and look inside! Headphones (repairing): Earbuds break easily. Here's how to fix them yourself! Hearing aids: How a tiny microphone and loudspeaker can make life better for people with hearing impairments. Lenticular printing: How can you make a book cover change its appearance as you tilt it from side to side? LIDAR: How can you navigate or map the world with a scanning laser beam? Loudspeakers: How to turn electricity and magnetism into Bob Dylan or Beethoven! LP record players: Before we had iPods and CD players, music came on thin plastic circles. Microphones: The opposite of loudspeakers, they turn sound into electrical signals. Pagers: Radio waves can be used to catch your attention if you're carrying a pager. Photocopiers: How a bright light and static electricity can make a copy of a printed page. Printing: Classic printing technology explained, from ancient times to modern. Radar: Using radio waves to locate hidden objects. Radio: Electromagnetic waves travelling at the speed of light can carry information through the air. RFID tags: They're in your library books, on things you buy in shops, and maybe even in your pet! Satellites: Buzzing over our heads, they take photos, help us forecast the weather, and relay phone calls. Telephones: Old-style phones use microphones, loudspeakers, and wire connections stretched between them. Telephones for the hearing impaired: Even people with hearing impairments can enjoy the convenience of telephone technology. Typewriters: Imagine writing your blog with gears, levers, and springs—that's how a typewriter puts your words on the page! Ultrasound: Using sound waves to see inside objects, from airplane engines to expectant mothers! Walkie-talkies: Short-wave radio is still a favorite way for police and the military to keep in touch.